The following baskets are some of the more recent baskets I have been making. I made my first Nantucket over 10 years ago using instructions in a "country" decorating magazine and a Tupperware bowl as a mold (I won't show you a picture of that basket). 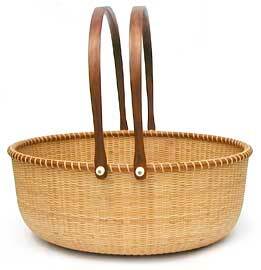 I eventually purchased some wooden molds and even taught a few classes, but I never felt my Nantuckets were up to the level of my other baskets. I finally took a class in the summer of 1998 and I couldn't believe how much I learned. You will see the basket I made below. 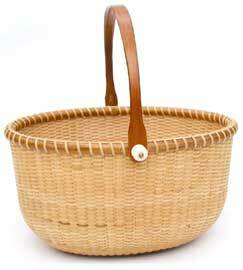 I now almost exclusively teach Nantucket basketry. If you have any questions or comments please feel free to contact me at the address/link below. I made these baskets with Eric Taylor and on my own. Eric has combined Shaker pounded brown ash with Nantucket construction. 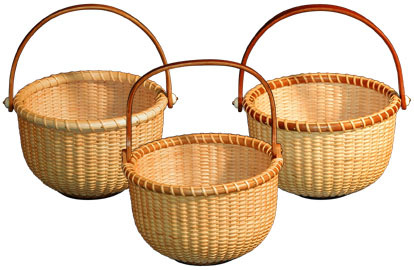 The baskets feature either oak, cherry or birch rims, handles and bases. 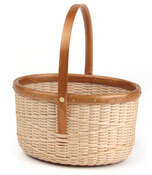 The lashless rims and clean lines of these baskets give them a fresh, contemporary feel. 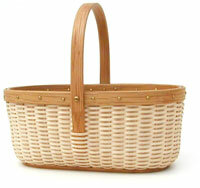 Some of the baskets feature diamond twill patterns or alternating width uprights. 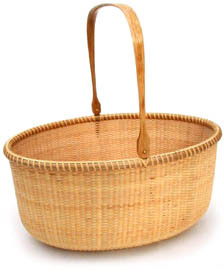 This is a reproduction of a basket made by Capt. Andrew Sandsbury of the New South Shoal lightship. 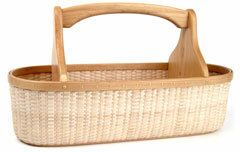 It is woven of cane over cane stave with oak rims, base and handle. There are over one hundred 5 mm staves in this basket. Needless to say the first 2 rows challenged my patience, after that it wasn't too bad to weave. These are 3 baskets I made using my new 5" mold. 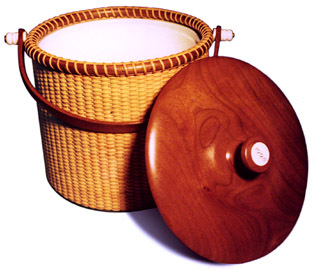 The basket on the left is the version I teach in class and it has an oak handle and base with a reed rim. 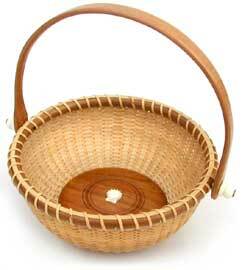 The basket in the center has an oak "bonnet" handle attached with wooden "ears", it also has an oak base and rims. The version on the right has all cherry wooden parts. All of these are woven of cane over cane staves. I really like the size and proportions of this 7" round basket. It has an oak base, rims and handle. Many people like the contrast of cherry wood to the cane. 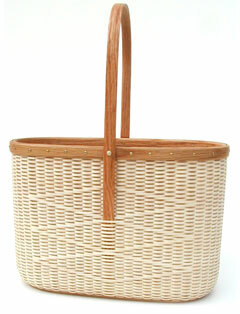 I think I like how the oak blends into the basket almost even better. 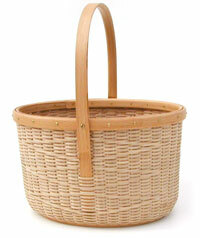 You can't see it here, but I added a small (15 mm) carved bone shell to the inside bottom of the basket. This is the second basket I have made on my oval purse mold. After much planning on stave shape and placement I was pleased with how the final basket turned out. It has a cherry base, rims and handle. 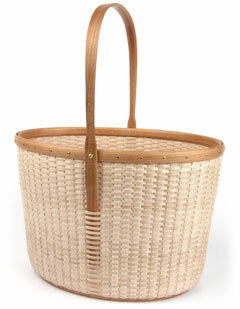 Like most of the Nantuckets I make it is woven of cane over cane staves. 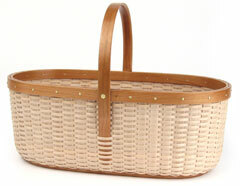 This basket was woven over a 5-part puzzle mold by Jim Rutherford. The challenge of this basket, besides getting the mold out, is the complicated double taper on the staves. They need to not only be tapered on to the base, but also to the top of the basket. 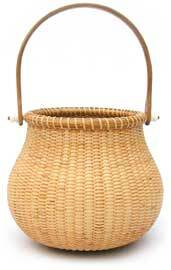 This basket is woven of cane on cane with an oak base and handle. 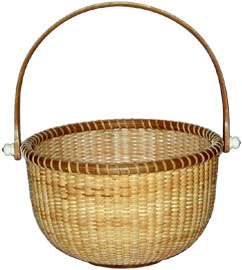 7" x 9" x 7"
Nantucket style basket woven of cane over cane staves with cherry base and reed rim. 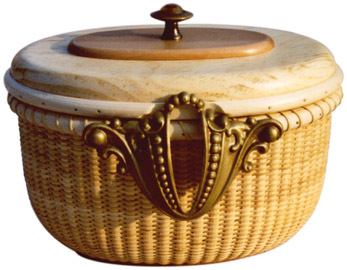 The lid is of pine topped with a cherry disk and rimmed in reed. This basket was created for the PAWS/St. Louis Silk Purse 3 Auction in 1997. The theme of the auction is to turn a "sow's ear" into a "silk purse". Artists and designers are asked to transform discarded furniture into pieces of art. I chose the large wardrobe pictured here because I thought I could incorporate the drawer pulls somehow into a basket. As you can see the final piece bears little resemblance to its original form. The side handles and the knob on the lid are the only parts that remained from the wardrobe. 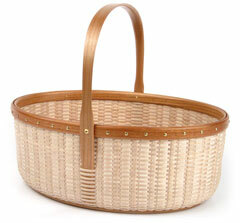 This huge oval basket was woven of cane over brown ash staves with cherry base, rims, and handles. 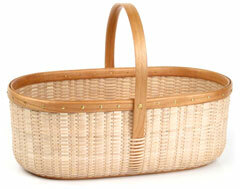 I made this basket during my week at Nate's Nantuckets in New Hampshire the summer of 1998. The class was lead by Lisa Thayer of Long Island, NY who was a wonderful teacher. I learned so much in the class that I went home an immediately finished up 3 baskets that had been sitting around for years waiting to be completed. Because of its size this was a very labor-intensive basket. It took us a good 30 hours of steady work to complete the project, but it was worth every minute. I made this basket during the evenings of the Big Boy class. I made it for my parents for Christmas and added a scrimshaw button inlaid into the lid with the date "1998". 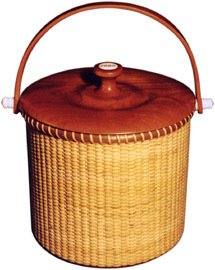 Instead of using a wooden mold to weave this basket the ice bucket itself served as a mold as I wove the basket around it. All the wood on the basket is cherry which looks great against the cane. I made this basket for my grandma for Christmas. It has a fancy cherry base, cherry handle and rims. It is adorned with bone knobs and a small carved bone shell from D.E.L.S Mfg. in Massachusetts. 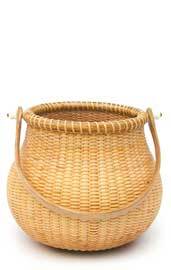 Like the ice bucket this basket was woven directly around the insert. Because of its unusual size I had to bend the cherry handle myself. I gave this basket to my aunt and uncle, and even though I don't drink wine I am going to make one for myself since I was so happy with how it turned out.